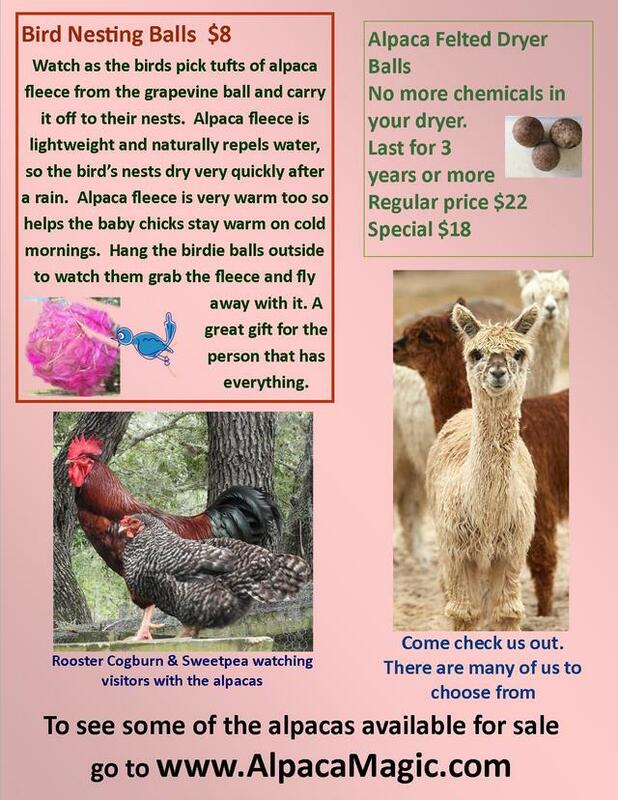 Alpaca Magic USA is a farm located in Homosassa, Florida owned by Jean Riley and Kent & Doreen Mylin. Directions: Don't use Google Maps or GPS after you are on Grover Cleveland Blvd. They will most always take you to the wrong place. Watch for red/white/blue banner flag and Alpaca Magic signs on the south side 3 1/2 miles from hwy 19 & 1/2 mile from hwy 491. Stay to the right and follow signs to the farm. Visit the alpacas FREE 7 days a week from 10 to 2. Meet the alpacas in person and they may even eat out of your hand. 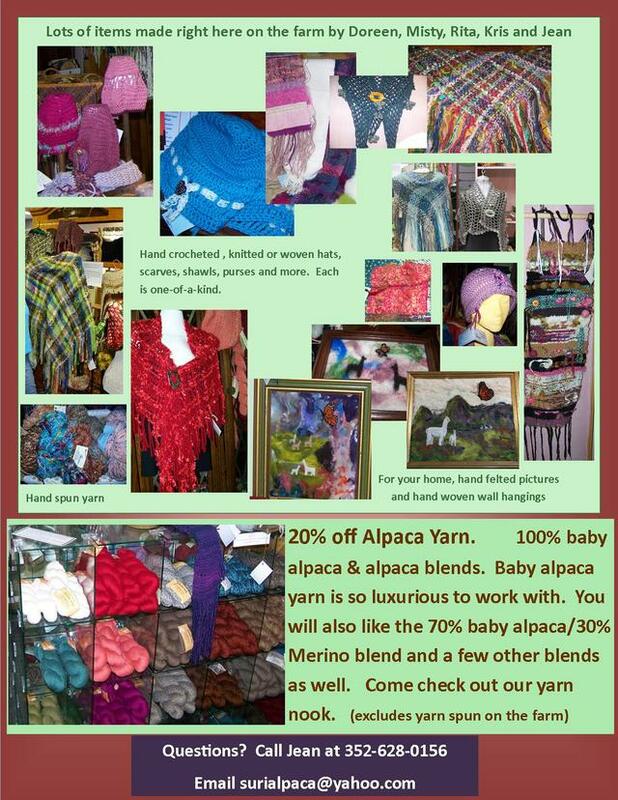 Browse through our store with many items made from alpaca fleece: hats, gloves, scarves, dryer balls, socks, yarn and much more. See our Magic T-shirt that is B&W indoors but explodes into color in the sun. Get your felting supplies and learn how to wet felt and needle felt. Needle felting is getting to be very popular. Purchase your needles and roving here to make your own felted masterpieces. Stroll through our gardens for unusual perennials and trees. We might have that accent plant you are looking for. A lot of butterfly host and nectar plants. If you would like something and don't have time to visit, give me a call and I'll ship it to you. Be sure to check out our alpaca T-Shirts!!! The Suri Alpaca has unique fiber characteristics that distinguish them from the rest of the camelid family; llamas, huacaya alpaca, vicuna, quanaco and the camel. The Suri Alpaca fiber has a cool slick hand; soft as cashmere, warmer than wool, with the luster of silk. Thinking about raising alpacas? Think about raising the rarest of breeds...the Suri Alpaca, less than 17% of all alpacas in the country, and in the world. 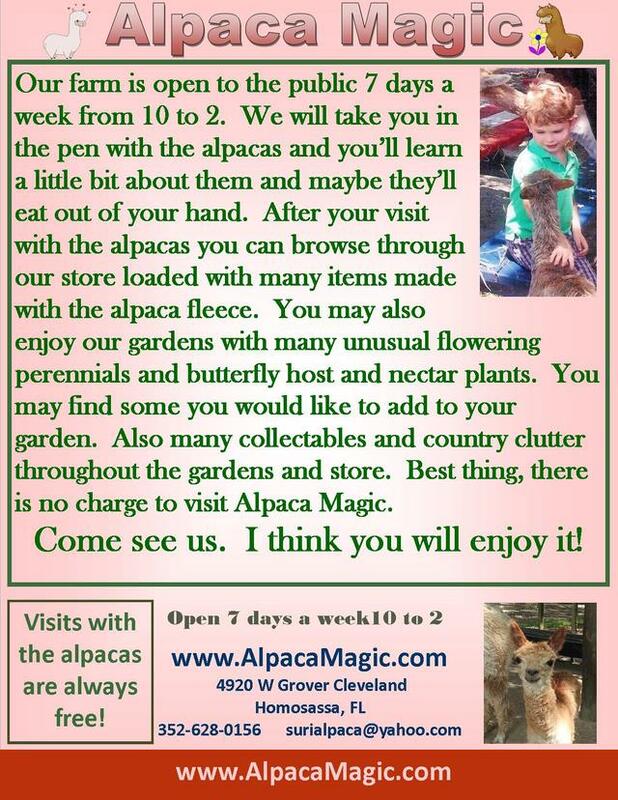 See our own Alpaca Magic, magic T-shirts; B&W indoors and explode into color in the sun! Located just east of Historic Homosassa Springs, in Homosassa, Florida, Alpaca Magic USA is home to about 20 suri alpacas. In 1996 we started out with just 2 pregnant females and have loved raising them since then. 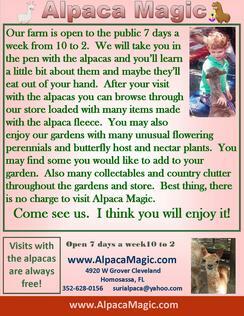 Alpaca Magic USA is a family owned and run business. Jean Riley and her Son, Kent Mylin and his wife, Doreen, work together to raise, breed and market these wonderful creatures. For many years we had close to 150 alpacas but since we are getting older and also have other interests (like our gardens), we will just have a few alpacas here on the farm. So if you are thinking about looking into purchasing some alpacas, this is a good time to visit our farm. Alpacas have come a long way since we started in the industry back in 1996. The quality of the alpacas today is so much superior to the alpacas 20 years ago. That is because most all farms, including Alpaca Magic, have "bred up" their alpacas. Every couple years we purchase new high-quality herdsires, (breeding males), and breed them to our best females creating an even better cria than the dam (the Mom). We shop for our breeding males all over the country to find just the right one to upgrade our herd. By doing this we can compete in the showring with some of the biggest farms in the country and come out of the ring with blue ribbons and Championships. Purchasing BRKRD Maxamus will help us continue to improve our herd. Maxamus won a championship ribbon 7 times, no wonder since his skin biopsy shows a density of 84.29 which is much higher than Dr. Norm Evans has ever seen. Max is breeding our girls now and we are anxious to see the results in the spring. Give us a call if you would like to breed one of your girls to Maxamus or perhaps purchase one of our females already bred to him. This is a great time to start your alpaca lifestyle. Don't want to raise alpacas? Be sure to visit us anyway. 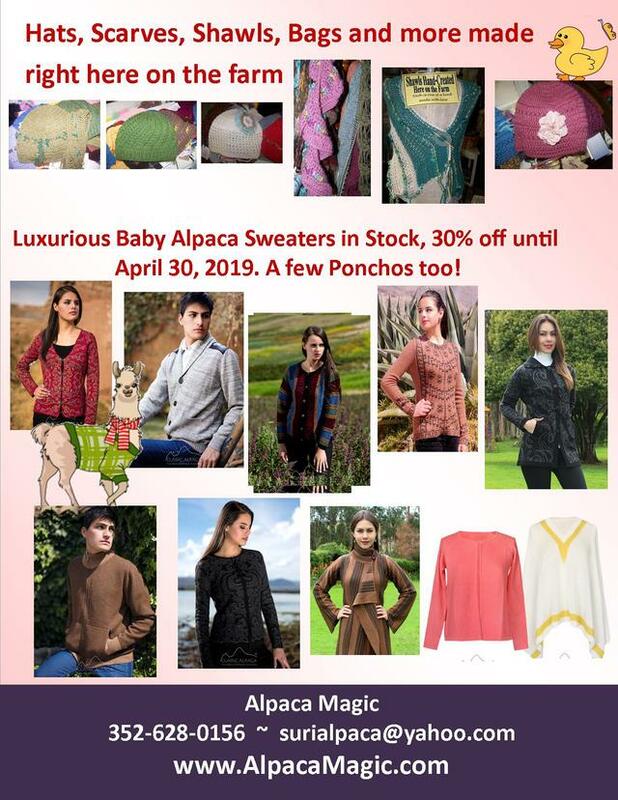 You will love to visit them and our store where you will find alpaca fur hats, baby alpaca sweaters, alpaca yarn, toy alpacas, needle felting supplies, alpaca socks, hand-made alpaca items and much more. We even have our own alpaca T-shirts. Also visit our gardens. Many unusual perennials, butterfly nectar plants and butterfly host plants.